Beauty comes in many forms, from a kind word, to a beautiful outfit, to a piece of art. 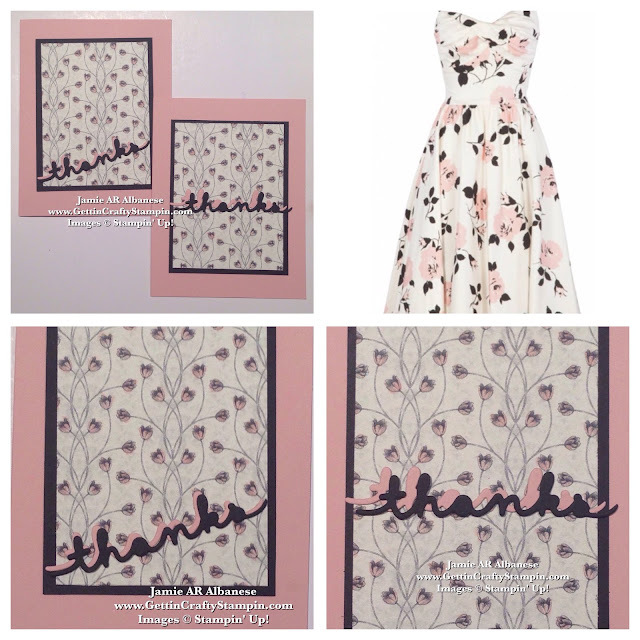 On this fun Fashion Friday Post I find inspiration in a beautiful dress that insoires a pretty hand-crafted Thanks card! Join me in celebrating beauty and sending it out when you enjoy one of our Card Making Classes! OK so I LOVE this dress!! I want it for myyyy collection. It inspired me to create this elegant card that was perfect for our recent Stamper's 10 Club meeting. A simple card that says so much with one simple word. Like this pretty dress, simple can be elegant. Finding inspiration from the beauty of what surrounds us, fashion is a fun way to combine two of my loves into one (Happy Fashion Friday!!). Altering this stunning collection of paper, the Timeless Elegance is probably the most stunning collection of paper in my 9+ years as a Stampin' Up! Demonstrator! Using the brush side of the Blushing Bride Stampin' Write Marker (from the Subtles Collection) coloring in these flowers is a fun way to create a coordianting look. Using the new Greetings Thinlits on our Big Shot Magnetic Platform and Die-Cutting Machine it's fun and easy to die-cut this greeting. Layered in both the coordinating Blushing Bride and Black card stock this shadowing of the two is a fun look. How simple it is to create this sentiment with a few twists of the wrist all in an easy hand-crafted card. Create and send beauty in the mail. 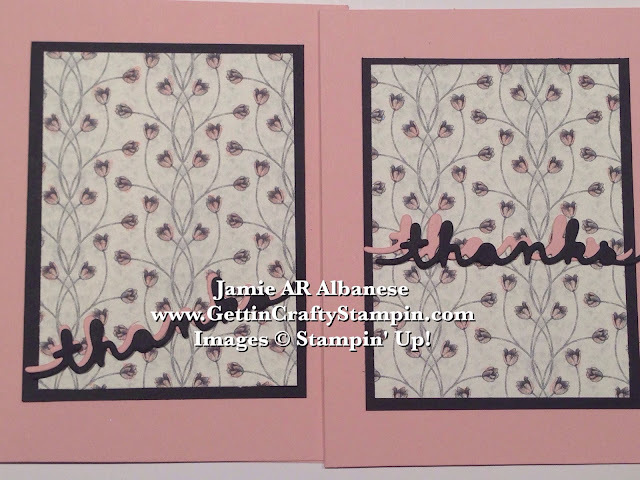 What a fun way to join in another's celebrations, needs and show your gratitude with a pretty hand-crafted card. Thank YOU for supporting my blog. Join Us at the Stamper's 10 Club and see what all the fun is about. I may not be able to draw much but I can create art and send beauty (inspired by fashion and life) when I create a hand-crafted card. Who knew that you could send art in the mail - lol.